Introducing The Self & Match System! Different Roads is thrilled to be adding The Self & Match System to our lineup! 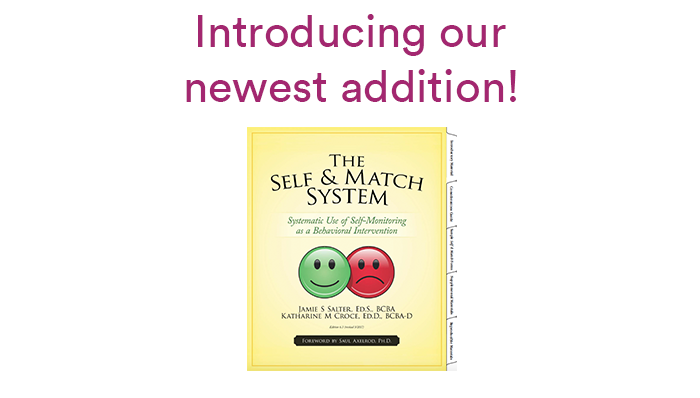 Created by Jamie S Salter ED.S, BCBA and Katharine M Croce ED.D, BCBA-D, Self & Match is a self-monitoring and motivational system firmly grounded in principles of ABA. This behavioral intervention encourages a collaborative approach to promoting behavioral success for children & young adults, using self-monitoring with a match component. Self & Match is a data-based and interactive intervention! Written by: Different Roads to Learning on August 1, 2017. Last revised by: July 31, 2017. This entry was posted in ABA, Applied Behavior Analysis, autism, autistic spectrum disorder, Pick of the Week, Products and tagged ABA, Applied Behavior Analysis, ASD, autism, autism spectrum disorder, Pick Of The Week, Self & Match by Different Roads to Learning. Bookmark the permalink.